One of Criterion's final 2018 releases is also one of the label's best. 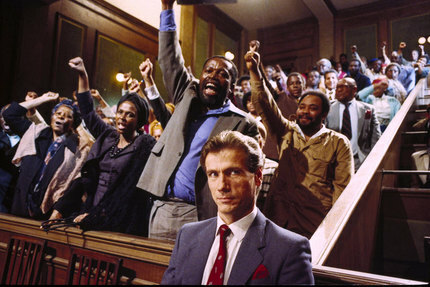 Joining the Criterion Collection at spine #953, Euzhan Palcy's 1989 apartheid drama A Dry White Season is a last-minute must-own from the label, after a preternaturally strong year (even for them). Great art has both specificity and universality, and it's hard not to be thunderstruck by the potency of Palcy's message for North American life in 2018, even as she expertly chronicles a tipping point in South Africa in 1976 with nuance and detail. A Dry White Season concerns two families -- the young sons of each are seen playing football on a grassy field over the opening credits -- who are linked together by worsening tragedy. One family is white: the Du Toits, an upper-middle-class unit with teacher Ben (Donald Sutherland) at the head. The other family is black, and their patriarch Gordon (Winston Ntshona) works for Ben as a gardener. When Gordon's son is beaten by police officers over a made-up infraction, Ben counsels Gordon that there's nothing that can be done. Matters escalate quickly, however, and soon Gordon's son is missing, and then dead; and then Gordon, himself, is arrested. Like Alice through the looking glass, Ben is thrust into, and forced to navigate, a violent, insensible world -- the reality of white supremacist law and privilege -- that he never knew was around him all the time, as he works to find some justice for Gordon and his family. Palcy's framing is precise and her cutting is rigorous. She achieves an Odessa Steps-level evocation of terror in the early police attack on a school protest, and the violence against black bodies in the film is vivid and clear, rendering it overwhelming, sickening, and ultimately transformative. A Dry White Season is a clear "message" picture, but I don't mean that pejoratively; it's meant to radicalize, and particularly, radicalize a white mainstream audience in America and around the world into waking up to their privilege. It succeeds. On the other hand, it's yet another story about a white man who needs to have it conclusively proven to him that racism and white supremacy are bad... and it takes Ben a blessedly long time to get there, too. But then, I grew up in the tail end of this era, and I thought apartheid and violent racism were something that happened far away, on another continent. I was a blind, white moron, and so is Ben. We watch the systems by which white supremacy protects itself as Ben digs deeper and deeper into his inquiry. The governmental angle is perhaps easiest to manage, since we've seen it in so many forms in so many other films. No less an authority than a mean old battleship of a Marlon Brando turns up at the picture's midpoint, for a brief but thrilling courtroom scene where he takes on the presumption of black guilt with a dry, cynical application of facts. Brando is exactly what you expect, and sounds like he wasn't mic'd correctly and then never bothered to show up for his ADR session... but he gives a great, convincing performance, always. The greater betrayals come from closer to home, as Ben's wife and eventually his adult daughter begin conspiring with the state to maintain their way of life by betraying Du Toit to the authorities. When Mrs. Du Toit, scorchingly played by Janet Suzman, says: "They'll swallow us up. It's our country, Ben. We made every inch of it. Look at the rest of Africa, it's a mess," echoes of nationalist rhetoric across the Western world can be heard in every syllable. Speaking of white women throwing people of colour under the bus, renowned third-party voter Susan Sarandon turns up in a small role as a journalist who helps Ben gather and publish his evidence. "Let me tell you something! It's news to me!" Ben barks in an awkward conversation with her, but a later turn where Sarandon preaches hope for the future in the face of pragmatism in the present is nicely delivered. Euzhan Palcy, rightly, gets the lion's share of the spotlight in the Blu-ray's special features. There is a half-hour conversation between herself and Scott Foundas that serves as both a narrative look back at the production of A Dry White Season, and more broadly, an overview of the early years of her career, including the production of her first film, Rue Cases-Nègres. There is also an even longer supplement where Palcy breaks down five scenes from A Dry White Season, called -- appropriately -- "Five Scenes." Now that Criterion seems to have moved permanently away from the director's commentary track, this video format is a good way to highlight key production aspects of the feature films in their catalogue. The other supplements are much more brief. There's an archival interview between Palcy and Nelson Mandela, which is less than three minutes long and amounts to a single question (but it's a good question). There's also a quick spot of Donald Sutherland discussing A Dry White Season on The Today Show, which includes a moment of Bryant Gumbel asking (if I am hearing him correctly) if the production of the film woke Sutherland up to his own white privilege in North America, and Sutherland misunderstanding the question. Ah, well.